For media purposes you may download the following imagery to go with the press release below. Please credit the images where you can. Renowned food writers, artists, chefs and even a former All Black feature in a new book celebrating the food and people of the Matakana region, a destination of choice for many of Auckland’s foodies. The Village Table features mouth-watering dishes, stunning photography and entertaining tales from many of the characters that give the area such heart. Local author Christine Sheehy led a team of writers who gathered over 40 stories celebrating the likes of international food writer Lauraine Jacobs and chef Amber Rose; Kirsty McKay and Mike Sutherland of the Sawmill Brewery; Christine Didsbury, co-founder of the Matakana Village Farmers’ Market and Brick Bay Winery; Dan O’Donnell formerly of Prego and founder of local institution Jin Jin; renowned permaculturist Trish Allen; and former All Black, Richard Turner. Also among the team was photographer and designer Lori Satterthwaite, food editor Emily Parker, food stylist Kate Arbuthnot, artist and photographer Katherine Norman, with favorite recipes submitted by school parents and members of the Matakana community. Alongside the stunning beaches and rural vistas, the region attracts visitors year-round to the famous Matakana Village Farmers’ Market, and world class restaurants, wineries and galleries just one hour north of Auckland. The Village Table will be released on 29 September 2018 as part of Feast Matakana, a three-week event series celebrating the food and beverages of the Matakana region. There are lunches hosted by celebrity chefs, themed dinners at local restaurants, a chance to meet food artisans on Feast Tours, and the annual Oyster & Wine Festival Matakana. The Village Table will be available for purchase at the Matakana Village Farmers’ Market, select retail outlets and online at www.thevillagetable.co.nz. All proceeds go towards the local primary school. Article published in the NZ Listener, 15 September, by Lauraine Jacobs. 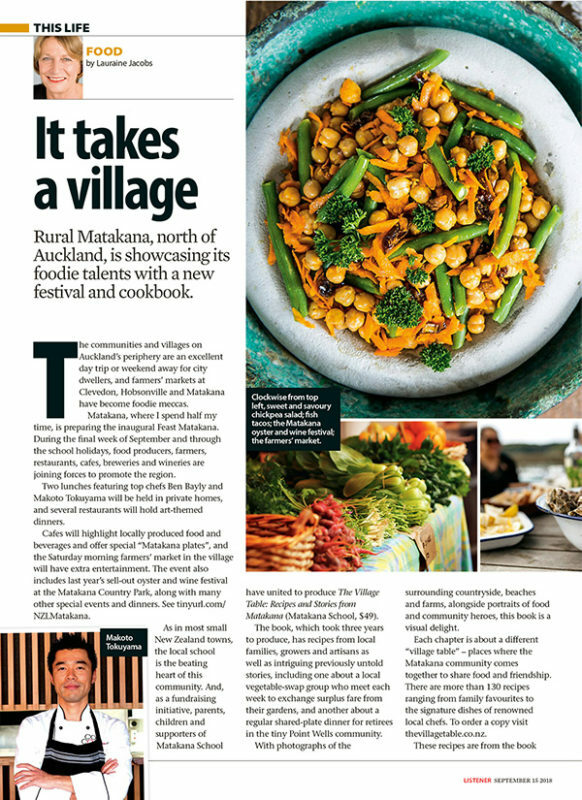 Read about Feast Matakana and our cookbook in Lauraine’s article in the NZ Listener. …Surrounding countryside, beaches and farms, alongside portraits of food and community heroes, this book is a visual delight.